Display the Create Invoices window by choosing Customers → Create Invoices. The Create Invoices window appears. Select the template or invoice form that you want to use from the Template drop-down list located in the upper-right corner. Which one appears by default depends on what you told QuickBooks about your business during the QuickBooks Setup. You can also create your own. Identify the customer and, if necessary, the job by using the Customer:Job drop-down list. Scroll through the Customer:Job drop-down list until you see the customer or job name that you need; then click it. (Optional) Assign a class to the invoice. If you use classes to track expenses and income, activate the Class drop-down list and select an appropriate class for the invoice. To turn this handy way of categorizing transactions on or off, choose Edit → Preferences, click Accounting on the left, click the Company Preferences tab, and then select or clear the Use Class Tracking check box. Press + (the plus symbol) to move the date ahead one day. Press – (the minus symbol) to move the date back one day. Press T to change the date to today’s date. Press M to change the date to the first day of the month. Press H to change the date to the last day of the month. Press Y to change the date to the first day of the year. Press R to change the date to the last day of the year. You can also click the button on the right side of the Date field to display a small calendar. To select a date from the calendar, just click the date you want. (Optional) Enter an invoice number in the Invoice # text box. Fix the Bill To address, if necessary. QuickBooks grabs the billing address from the Customer list. Fix the Ship To address, if necessary. QuickBooks also grabs the shipping address from the Customer list. (Optional … sort of) Provide the purchase order number in the P.O. Number text box. If the customer issues purchase orders (POs), enter the number of the purchase order that authorizes this purchase. Specify the payment terms by selecting an option from the Terms drop-down list. (Optional) Name the sales representative. If you want to track sales by sales representative, use the Rep drop-down list. To quickly add a sales rep, select Add New and then use the handy-dandy dialog boxes that QuickBooks displays. To work with the Sales Rep list, choose Lists → Customer & Vendor Profile Lists → Sales Rep List. Specify the shipping date if it’s something other than the invoice date. Specify the FOB point by using the F.O.B. text box. FOB stands for free-on-board. The FOB point is more important than it first seems because the FOB point determines when the transfer of ownership occurs, who pays freight, and who bears the risks of damage to the goods during shipping. If a shipment is free-on-board at the shipping point, the ownership of the goods being sold transfers to the purchaser as soon as the goods leave the seller’s shipping dock. In this case, the purchaser pays the freight and bears the risk of shipping damage. If a shipment is free-on-board at the destination point, the ownership of the goods that are being sold transfers to the purchaser as soon as the goods arrive on the purchaser’s shipping dock. The seller pays the freight and bears the risk of shipping damage. Enter each item that you’re selling. Move the cursor to the first row of the Quantity/Item Code/Description/Price Each/Amount/Tax list box. After you move the cursor to a row in the list box, QuickBooks turns the Item Code field into a drop-down list. Activate the Item Code drop-down list of the first empty row in the list box, and then select the item. If you need other items on the invoice, use the remaining empty rows of the list box to enter each one. Enter any special items that the invoice should include. To describe any of the special items, activate the Item Code drop-down list of the next empty row and then select the special item. If you want to include a Discount item and have it apply to multiple items, you need to stick a Subtotal item on the invoice after the inventory or other items that you want to discount. Then stick a Discount item directly after the Subtotal item. QuickBooks calculates the discount as a percentage of the subtotal. Click in the Customer Message box, activate its drop-down list, and select a clever customer message. To add customer messages to the Customer Message list, select the Add New option and then fill in the dialog box that QuickBooks displays. If it isn’t correct, move the cursor to the Tax list box, activate the drop-down list, and select the correct sales tax. (Truly optional) Add a memo. You can add a memo description to the invoice if you want to. This memo doesn’t print on invoices — only on the Customer Statement. A completed Create Invoices window. If you want to delay printing this invoice, select the Print Later check box that appears with the ribbon of buttons and boxes above the main part of the Create Invoices window. Save the invoice by clicking the Save & New button or the Save & Close button at the bottom of the window. 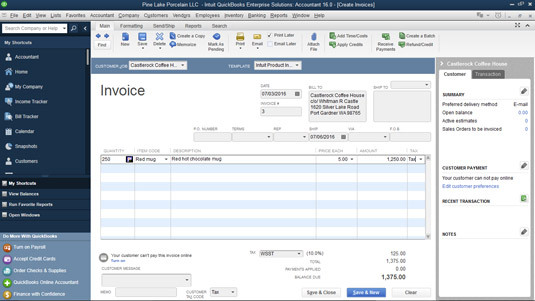 QuickBooks saves the invoice that’s onscreen.